This past month, organizations from across Denver took time to focus on and celebrate Health Literacy Month, a time to promote the importance of taking action and finding ways to improve health communication. Rose Community Foundation has long-worked to reduce disparities for everyone seeking healthcare by working with organizations that make health literacy a priority. Read below for some case studies from two of our Health grantees that have seen the benefits of this work first hand. At Boomers Leading Change, our entire programmatic structure depends on increasing health literacy. Our AmeriCorps Encore program annually deploys up to 24 individuals age 55 or better in direct-service roles at about 10 local nonprofits working with medically underserved populations. At any given time, we have more than 50 volunteers over the age of 50 working at up to 30 nonprofits. All of our AmeriCorps Encore members and volunteers must first complete a 30-hour Patient Navigation training program that builds the health literacy vocabulary for participants. Once they are placed at a nonprofit organization, health literacy rolls out like a ripple effect. In one organization, a volunteer may be teaching a refugee the importance of keeping a doctor’s appointment, at another, an AmeriCorps member may be knocking on doors to encourage parents to take their young children to well-child checks. At another host site, one of our people may be part of a care team helping parents understand a child’s need to see a mental health counselor. Each year, we interact with thousands of people and almost all of these interactions help elevate the health consumers’ understanding of what they can do to support their own health and well-being. That’s what health literacy is all about. And that’s what our volunteers are trained to do. 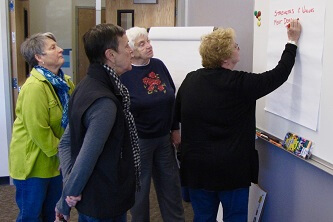 Project SHINE teaches Health Literacy to refugee and immigrant elders and their families living in Denver and Aurora. Activities and classes are held in apartment community rooms and ethnic adult day cares. The communities learn how to read medication, ask questions at the doctor’s office, the importance of annual check-ups, mammograms and routine dental visits. Project SHINE at Spring Institute purposefully and strategically trains residents in apartment buildings to be Health Leaders. These Health Leaders are often called on after hours or on the weekends to teach someone how to call and schedule an appointment or to assist with reading a medical bill. Through this work we are absolutely seeing a healthier community that is learning that they can make choices about their health care. And we are proud of the results.